BrooklynRowHouse is located in south Brooklyn, or Brooklyn South for the locals, in an area called Bay Ridge. For Google Maps fans, here we are. 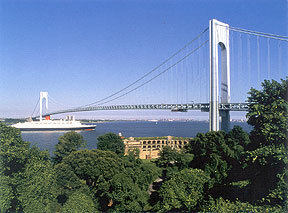 We sit on lower NY harbor on the narrows between Brooklyn and Staten Island, connected by the Verrazano Narrows Bridge, which was the world's longest suspension span bridge for about five minutes when it opened in 1964. One of the coolest things about this neighborhood are the big ships and the lonely foghorns at night which are obliterated only by low-flying helicopters from NYPD's heliport three blocks away. 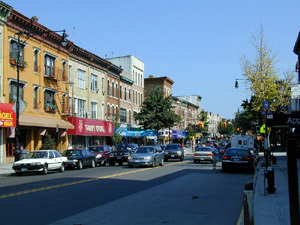 Bay Ridge is a generally quiet, increasingly upscale bedroom community. It's close enough to Manhattan to be reasonably friendly to daily commuting but far enough away to have it's own distinct community feel. In fact, many Bay Ridgers have no interest at all in Manhattan. I've met people who haven't visited "the city" in a decade or more. Why should they? For one, Bay Ridge offers one of the best "restaurant rows" in NYC with excellent restaurants like Cebu, Meze, Bay Ridge Sushi, Tuscany Grill and some of the best Italian food in the city. This neighborhood being Irish and Italian, there's certainly no shortage of pubs either, from pretentious wine bars to old school neighborhood tap rooms, like Three Jolly Pigeons. 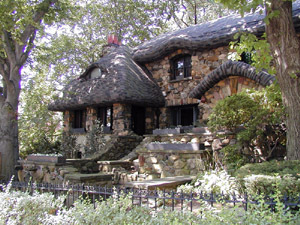 to everything in between, like the arts-and-crafts "Gingerbread House", which is located a few blocks from here. But up until the past ten years or so Bay Ridge has been known mainly as a blue collar community: cops, firefighters and young families with first homes. Bay Ridge was immortalized as a middle class area in the movie Saturday Night Fever. The disco portrayed in the movie actually existed: 2001 Odyssey Disco on 64th Street. The club and it's lighted dance floor closed only last year. It was mostly filmed on location and I like seeing my neighborhood thirty years ago. 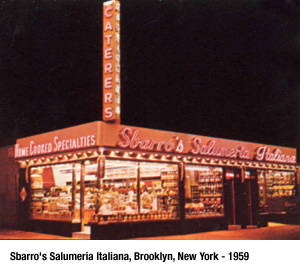 Another well-known Bay Ridge area denizen is the now-ubiquitous Sbarro restaurant. It began as a popular local salumeria (Italian grocery store), years before it grew into the highway rest area chain monster it became. This original store closed two years ago. If you think Sbarro's origin is a bit weird, I was surprised to learn that yet another chain restaurant was started by a Bay Ridger: Boulder Creek Steakhouse. I've tried the latter. I don't know which was more tender: the steak or my belt. 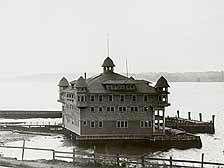 Forgotten New York has a great thumbnail pictorial history of Bay Ridge but my next door neighbor, Betsy, has the best collection of old photos from the neighborhood, like this circa 1905 picture of the Crescent Club. I've gotta smile when I think that my house was probably under construction at the time this photo was shot. While much of Bay Ridge is "old Bay Ridge" -- and by that I mean that there are lots of Bay Ridgers here who can trace their lineages back to a great grandparent who also lived here -- the area has come under assault from late-comers like me: wannabe homeowners who were priced out of Manhattan, Brooklyn Heights and Park Slope real estate. Even in the short few years that I've been here I've seen real estate values triple and more. In fact, a real estate agent told me last month that she could sell my house for four times what I paid for it in 1999. That means that I've earned as much paper wealth just from owning this house as I have actually working for a living! That's sick. Ethnically, Bay Ridge has an unusual diversity. It's a small enclave of old-school republican conservatism in one of America's most liberal cities, which also means that it's conspicuously caucasian (for NYC). At the same time it's one of the most diverse neighborhoods in the city, most recently with a heavy influx of middle class Arabs, Russians and Asians. 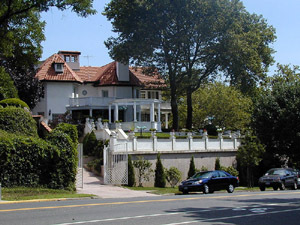 South Bay Ridge is traditionally "Italian Bay Ridge" while my neighborhood was known as "Irish Bay Ridge". In fact, my neighborhood's history is as much Norwegian and Newfie as anything else. Norwegian Day is a huge event in Owl's Head Park. Owl's Head Park is at the bottom of my block and is one of the nicest city parks outside Manhattan. But only the newbies call it Owl's Head. Old timers still call it Bliss Park. This neighborhood was once a huge estate and farm belonging to Eliphalet Williams Bliss, a former machinist who built the EW Bliss company and who profited heavily in the munitions industry during the 19th century. Bliss is credited with inventing the torpedo. 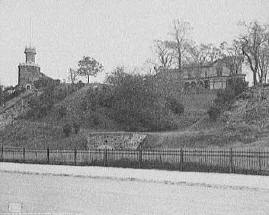 Here's what Owl's Head Park looked like in 1906. I think I can make out what is now the dog run where I bring Jack and Auggie every morning. No neighborhood history is complete without dropping some famous names. Silent film star, Clara Bow, was born here. The actress, Lillian Russell, used to live here in a house bought for her by Diamond Jim Brady. 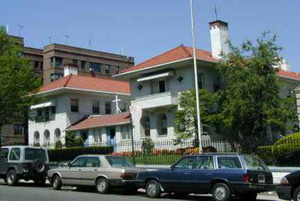 It's now a Catholic girl's school, Fontbanne Academy. Both Robert E. Lee and Stonewall Jackson had houses here, back when they were stationed at Fort Hamilton, which is still an active, albeit small, military base in Bay Ridge. More currently, the actress, Marisa Tomei, is from here, or rather right next door in Dyker Heights. She didn't develop her accent in My Cousin Vinnie in a vacuum. It's classic south Brooklyn princess as was her in-your-face sarcasm. Two of the cast of The Sopranos are from around here too: Steven Schirippa (Bobby Bacala) and Tony Sirico (Paulie Walnuts). I've seen Sirico in the local delis. Another Sopranos cast member, Joseph R. Gannascoli ("Vito Spatafore") used to own a restaurant a few blocks from here, Soup As Art. Film crews are all over the neighborhood this week shooting a new NBC series called The Black Donnellys about four kids who get sucked into the Irish mobs. Are you getting the idea that Bay Ridge might also have some attraction for the underworld? Well, it's true but that's not as bad as it sounds because Bay Ridge is also popular with senior law enforcement types. As a result it's one of the most crime-free areas of the city. Petty crooks know better than to work a neighborhood where their victim could easily be a cop, a fed, a judge or (worse) a Gambino. Bay Ridge is the first neighborhood that the runners in the NYC Marathon see after the starting gun. It was also one of the hardest hit by 9/11 because of all the firefighters, cops and young financial wizzes who live here. You can't walk too far around here without encountering a family's memorial to its fallen loved one. Now that I'm finally getting a handle on my SLR digital camera, stay tuned for the Christmas photos. If you think you've seen some outrageous Christmas displays, you ain't seen nothing until you've seen Dyker Heights during the holidays. similar to Tony Sirico - even had the white 'wings" in his hair - this character - unlike "Paulie" was very discheveled though - so it was hard to picture the transition in my mind...can you advise if Tony had a little part in the Donnellys? I don't know about Sirico being on The Black Donnellys. Unfortunately, NBC canceled the show due to low ratings, which is too bad because I was just starting to get into it. shirippa didnt own soup as art. another soprano's cast member joe gannoscoli who played vito spatafore owned it.